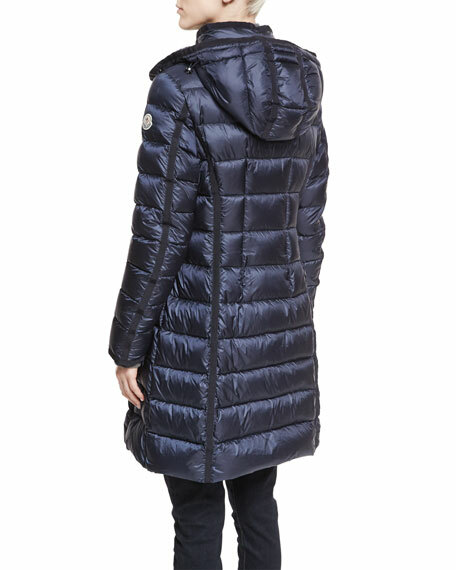 Moncler "Hermine" long puffer jacket. Akris "Todd" coat in Fruit of Vienna metallic-jacquard. Notched lapels; button front. Long sleeves with zippers. Side flap pockets. Tailored fit. Knee-length. Cotton/polyester. Lining, viscose. Imported of Italian materials. CALVIN KLEIN 205W39NYC fireman-inspired coat in distressed resin-coated cotton gabardine. Reflective stripes at cuffs and hem. Spread collar; clasp closures. CALVIN KLEIN 205W39NYC fireman-inspired coat in distressed resin-coated cotton gabardine. Reflective stripes at cuffs and hem. Spread collar; clasp closures. Long, couture sleeves. Patch pockets. Oversized silhouette. Midi length. Professional clean only. Made in Italy. Model's measurements: Height 5'10"/177cm, bust 31"/79cm, waist 24"/61cm, hips 34"/86cm, dress size US 2. Isabel Marant "Wild West" striped blanket coat. One-button front; fringe border. Full shoulder coverage. Oversized design. Calf-length. Frayed edges. Virgin wool/nylon. Lining, cotton. Made in Poland. Johanna Ortiz "Ser Garnel" kimono coat in plaid suiting with western seaming. Approx. 53"L down center back. Notched lapels; open front. Shoulder epaulettes. Long, blouson sleeves. Relaxed fit. Ankle-length. Dry clean. Wool. Made in Italy. Model's measurements: Height 5'10.5"/179cm, bust 32"/82cm, waist 23.5"/60cm, hips 34.5"/88cm, dress size US 2.